Win a life-size Dalek Sec! In this week’s issue of Doctor Who Adventures you’ll find the second part of a competition to win a life-size Dalek Sec. If you missed the first part, don’t worry – as there will be a bonus token in the next issue! 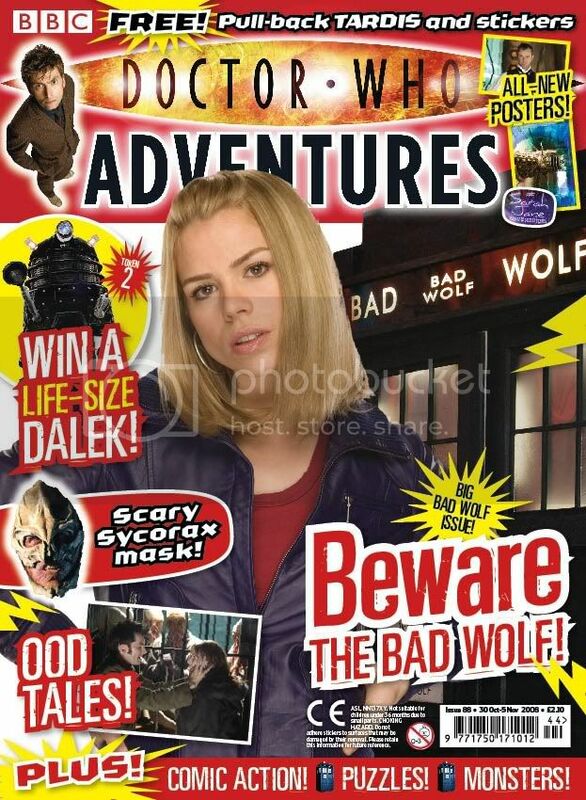 What was the Bad Wolf? If you’ve been wondering that, then don’t miss our fascinating fact file about Rose and her mysterious messages to herself. Also this week, there’s a free pull-back TARDIS and sticker sheet. Pull it back to instantly recreate a crash-landing scene with a whizzing TARDIS! o Three posters! Sarah Jane Adventures, the Master and Rose. o Tales from the TARDIS: A scary scene from Planet of the Ood. o Make a mask: Cut out your very own bone-headed monster – a Sycorax. o Sarah Jane Adventures: An interview with Mr Smith and a sneak preview of the next episode. o Who’s where: Monsters invade the manor… can Agatha Christie help the Doctor? o Ultimate Tenth Doctor: Collect the final part of our mini mag! o Comic strip: The Doctor and Donna visit The Man in the Moon. o Bloodtide and Doomfinger’s perilous picture puzzle: Help the Mothers! o Subscription offer: Subscribe and you’ll get FREE Doctor Who Dalek and Cyberman figures. Doctor Who Adventures, priced £2.10, is out today. Get your copy now! This entry was posted on October 30, 2008 at 1:44 pm and is filed under Doctor Who Adventures. You can follow any responses to this entry through the RSS 2.0 feed. You can leave a response, or trackback from your own site.